An exhausted horse drops dead in “The Lone Ranger.” Enigmatic Comanche Tonto (Johnny Depp) walks to the body, pokes it and astutely, drolly notes “this horse is dead.” Thankfully, that dead horse only gets a gentle prod, but unfortunately for the audience the film beats figurative dead horses to a bloody pulp. Overlong and tonally schizophrenic, director Gore Verbinski’s attempted combination of classic western tale/buddy comedy/big budget action-adventure is an exercise of boring excess. It’s as if plot points and Old West action set pieces were pulled out of a cowboy hat and thrown together randomly. We begin with a completely unnecessary framing device that only serves to extend the film’s running time a few more brutal minutes and break up the action throughout. A young boy at a fair in 1930s San Francisco happens upon an ancient Tonto, who recalls his tales of adventure. A role reversal conceit involving familiar characters contains promise, and seeing the stoic faithful companion of the Lone Ranger give his personal perspective could be interesting, but alas that’s not the intent. Tonto taking the central role is due solely to Depp’s star-power and an excuse to reincarnate the actor’s Captain Jack Sparrow of “Pirates of the Caribbean” fame as an Indian. Though Depp has his moments and remains a magnetic screen presence, much of his tomfoolery feels woefully uninspired. And, oh yeah, the Lone Ranger does make an appearance in the film. John Reid (a game Armie Hammer) is a straight-laced recent law grad en route to his hometown to become District Attorney. The train shepherding him also has Tonto and vile outlaw Butch Cavendish (snarling William Fichtner) held in a prison car. In the first overblown train sequence in the film, a daring escape frees Cavendish and Tonto and Reid jump around from car to car until the inevitable crash. For two guys who have just met, their comedic timing is impeccable. After a few more standard contrivances, Tonto and Reid come together to take down the fugitive and his band of outlaws; Reid in the name of justice and Tonto seeking revenge for an oddly explained cause, told in flashback at a strange point in the narrative. There are requisite surrounding flourishes thrown into the mix with The White Man building railroads through Indian Territory in the name of progress, a damsel (and son!) in distress (Ruth Wilson), political corruption and robbery, but nothing ever gels and the film is a jumbled mess. 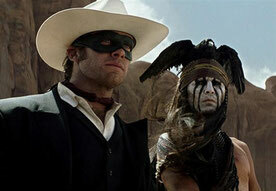 Building the film around Tonto leaves little opportunity to form the myth of the Lone Ranger. Hammer is mostly reacting to Depp and certainly takes on the submissive role – as seen in Tonto’s disparaging definition of ‘Kemosabe’. While we at least get a sense of who the ranger is fighting with and against, we have no sense of who he’s fighting for – a key component at the heart of any hero story. The damsel is too thinly drawn to care about and there are no ‘good old townsfolk’ to speak of. Tonto and the Ranger simply go through the motions to play out the all-over-the place narrative. You could say he’s fighting for the oppressed and misrepresented Comanche tribe, but the film treats them as an afterthought and an excuse for a battle scene. In a rather off-putting sequence, dozens of warriors are mowed down at the orders of a military captain (Barry Pepper); all of the power and dark ambiance zapped by intercutting with a comedic silver mine escape perpetrated by the Ranger and Tonto. The scene ends on what is supposed to be a powerful moment with Pepper’s character seeing the blood on his hands and appearing to be morally conflicted. But (in an example of the rapid tonal shifts and unevenness of the film), in the very next scene the captain has seemingly forgotten all about this. He boyishly fetishizes the ivory prosthetic leg of Madam Red (Helena Bonham Carter), who herself only exists to shoot a couple things with the trusty shotgun built into her fake appendage. All of the mismatched pieces inexplicably come together in a final action scene involving two trains and multiple tracks and jumping back and forth, shooting, punching, hitting with shovels, throwing of rocks and blowing up of bridges. This scene is a microcosm of the film as a whole – seemingly endless and void of tangible stakes. Lovers of the classic theme from the old Lone Ranger TV show can note (or be warned) that the music does indeed play during the climax – on a loop for approximately 20 minutes. If you loved it before, you may never want to hear it again after the film. This is just another example of the relentless overkill contained within a helplessly obtuse film that has no realization that bigger does not always equal better.